Disclaimer - MUST READ PLEASE ! 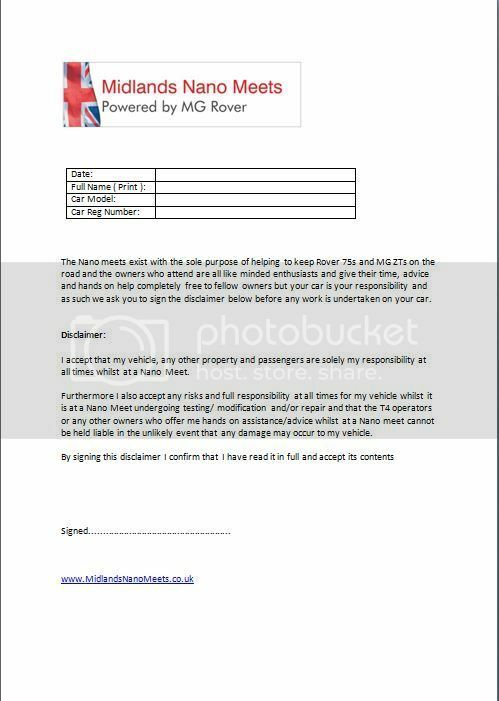 We are introducing a simple disclaimer for owners to sign before any work is undertaken on their car at a Nano Meet, this will start with all T4 sessions and may then be expanded to other jobs after the initial " testing". We have not taken this decision lightly, we realise that it brings some formality to an otherwise informal meet, and it is NOT as a result of anyone having their car broken/damaged whilst at a Nano, in fact so far we have been having meets since 2009 and no owners have ever left with their cars in any way compromised. The new measure is intended to make owners fully aware that that their car is their own responsibility whilst at a Nano Meet and any advice/hands on help given by fellow owners is given free of charge in the true spirit of the Nano Meets, ( see Nano Ethos thread at : viewtopic.php?f=18&t=13 ) and to accept that we are not a commercial enterprise but just a group of fellow enthusiasts with the aim of keeping Rover 75s/MG ZTs on the road. We see this as a sensible and common sense step forward as we have seen the meets grow in size from 3 cars at the very first one to over 50 cars over a weekend with owners coming from far and wide to attend, which we very much encourage and want to continue. The disclaimers will be kept in the T4 area, put your name down on the board in the usual way to get your place booked, and then when it is your turn you will be asked to sign before the T4 is connected to your car. Good idea,Rob,makes it clear for everyone,all you guys do a great job,and as the ad says : Above all else it's a Rover! It's better safe than sorry, but I hope that it'll never happen that something goes wrong, you can never say never though!